James was born circa 1846 at Appleby, Lincolnshire. His father Richard, a boot and shoe maker, provided a place or worship at Appleby when the Primitive Methodists were unable to build a chapel. (It was not until 1905 that a Primitive Methodist Chapel was built at Appleby.) The 1861 census shows Richard working as a rural post messenger. James brother, Robert William, also became a PM Minister. James started work at the age of nine and at fourteen entered service with one of the county families. His conversion at the age of seventeen changed his whole life. With few opportunities for fellowship, James retained his faith, largely through correspondence with a class leader. A change of situation gave him opportunities for study, and his gifts and graces became evident. In October 1870, James was called to Leeds III Circuit to serve as Circuit Missionary. From there he entered the ministry. 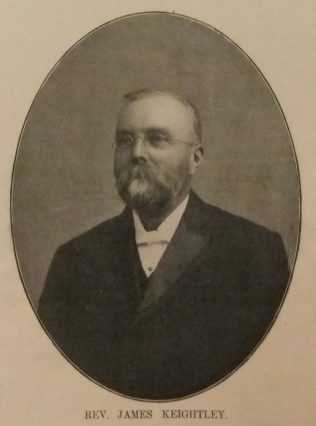 James ministry was a strenuous one, and in most of his circuits Connexional property either increased or improved; Rehoboth (Bradford II) and Portland Memorial (Lincoln I) were among his chief enterprises. James served as Building Committee Secretary in the Leeds and Bradford District and later as Secretary to the Missionary Committee in the Grimsby and Lincoln District. In Lincoln, James served as Secretary and President of the Free Church Council and as a member of the Lincoln Board of Guardians. His obituary records that he was an excellent preacher, graceful in style, choice in language, fervent in delivery. His sermons were full of solid truth, carefully prepared, nor did they lack pointed appeal, and, as a consequence, visible results attended his ministry. James married Emma Maria Hall (abt1846-1940) in the summer of 1875 at York, Yorkshire. Census returns identify five children. James died on 1 September 1918 at Barnsley, Yorkshire.